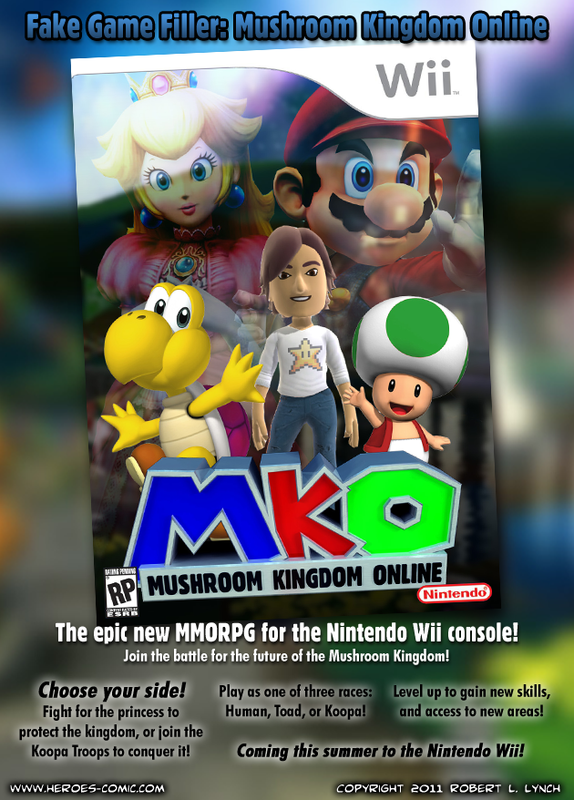 0474 - Fake Game Filler: Mushroom Kingdom Online - Heroes Inc.Heroes Inc.
Just to let you know, I haven’t completely forgotten about this comic, I’ve just been busy with IRL stuff lately…New comics… Eventually? Very nice to see that you haven’t forgotten us! I’d definitely play that. Especially if you could launch Koopa NPCs at enemies! And it needs all the power ups, except star. Wishful thinking aside, I’m glad you haven’t forgotten about us. Then again, you never actually have. I hope everything works out. That looks like an official ad. What program do you use and how did you do the lettering? hellyes. Go rob, gonna be a forever reader dewd!!! would Yoshi’s be the fast travel system? I fear that one day Rob will stop posting altogether with no explanation, and the internet will end. I know you are very busy, but I don’t think that you’ve updated this in over a month!